After September 11, 2001 terrorist attacks (9-11) airlines across the country struggled to keep their doors open and their planes in the air. Some carriers parked their planes in the desert. United Airlines was one of the carriers that were hit the hardest during and after the attacks on 9-11. On September 11, 2001, four passenger planes were hijacked by al-Qaeda terrorists. American Airlines Flight 11 and United Airlines Flight 175, were crashed into the World Trade Center in New York City, two hours later another American Airlines jet Flight 77 was crashed into the Pentagon and another United Airlines jet Flight 93 crashed in Pennsylvania after passengers tried to overcome the hijackers. This was a major blow for United Airlines, coupled with inflated jet fuel prices and higher labor cost. That year United Airlines suffered a $2.14 billion loss. The following year United Airlines filed for Chapter 11 bankruptcy protection. As a result United reduced its fleet size, furloughed thousands of workers, shutdown all of its ticket offices, discontinued some if its routes, downside its Miami operations, closed several maintenance facilities and terminated feeder contracts with United Express Atlantic Coast Airlines and Air Wisconsin. The company then began an all coach low cost carrier service. To further reduce company cost, in 2005, United Airlines cancelled its pension plan in the largest such default in U.S. corporate history. That same year United Airlines was able to raise $3 billion in capital, financing needed to exit bankruptcy and the following year United Airlines entered into discussions with Continental Airlines on a merger. 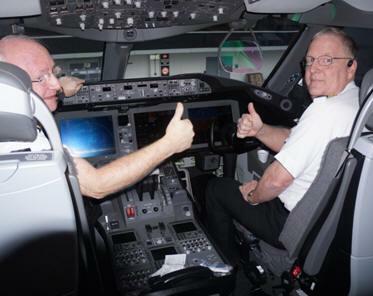 In 2008, United Airlines sent out notices that it would furlough 950 pilots or 15 percent of its pilots. This was the biggest pilot layoff since the layoffs following 9-11. The layoffs continued through 2009 and the company further reduced its fleet size. In a statement the carrier promised the pilots that when conditions improved they would be brought back onboard. By the summer of 2010, there were little over 1,400 United pilots on furlough and by fall of that year United Airlines and Continental Airlines merged. In 2011 the two carriers received a single operating certificate from the FAA. Howard Attarian, United's senior vice president of Flight Operations said today, "We look forward to welcoming back our co-workers as we complete work to integrate all of our pilots into a single work group. We are pleased to have this group of talented aviators back on our team. They are among the most experienced and most accomplished in the industry." Training classes for the recalled pilots will begin next month and run through the end of the year. In total, United has more than 12,000 pilots. United Airlines is now the world's largest airline in terms of fleet size and number of destinations. United Airlines and United Express operate an average of 5,341 flights a day to more than 360 airports across six continents. In 2012, United and United Express carried more passenger traffic than any other airline in the world and operated nearly two million flights carrying 140 million customers. The United Master Executive Council (United MEC) of the Air Line Pilots Association applauded United Airlines' announcement of the recall of all furloughed United pilots. Among the total pilots who were furloughed (1,437), 342 have already been offered recall and another 600 took positions with Continental. About 500 pilots are awaiting recall. "We welcome our brother and sister pilots back with open arms," said Captain Jay Heppner, chairman of the United MEC. "We have worked toward this day for more than five years. The recall of these pilots offers further proof that we stand at a new beginning for this pilot group, now 12,216-pilot strong. I am secure in the knowledge that our furloughed pilots will be returning to a much better contract and to an airline with a brighter and more confident future. Now, all United pilots, together, can meet the challenges of our future as we build the world's best airline." United is investing in upgrading its onboard products and now offers more flat-bed seats in its premium cabins and more extra-legroom economy-class seating than any airline in North America. In 2013, United became the first U.S.-based international carrier to offer satellite-based Wi-Fi on long-haul overseas routes. The airline also features DIRECTV on 200 aircraft, offering customers more live television access than any other airline in the world. United operates nearly 700 mainline aircraft and has made large-scale investments in its fleet. In 2013, United will continue to modernize its fleet by taking delivery of more than two dozen new Boeing aircraft. The company expanded its industry-leading global route network in 2012, launching nine new international and 18 new domestic routes.